Months have a pattern: All months feature weeks of seven days. The month can start on any day of the week. And months have a varying number of total days, 28, 29, 30, or 31. Given this data, you can display the days and weeks of any month when given only a specific date and the day of the week upon which it falls. In C, you can easily count from 000 to 999 (decimal), from 000 to 777 (octal), and from 000 to FFF (hexadecimal). These examples are in bases 10, 8, and 16, respectively. When it comes to counting from AAAA to ZZZZ, however, you must code your own routine. A filter is a program that accepts standard input and generates standard output. These programs are fun to write, providing you have a goal in mind and some way to manipulate the incoming text in a manner that’s significant enough to notice in the output. Recently, I created a playlist of songs on a certain online subscription service. I chose to shuffle the tunes, but found that one song in particular played more often than the others. My immediate thought was, “Why can’t the programmers design a shuffled playlist that doesn’t overplay the same song”? Rather than email the programmers, I thought I’d present the puzzle as this month’s Exercise. I’ve been working on a program that counts unique words in a text file. It’s an interesting exercise and explores the larger realm of pattern matching. You can try such scanning on a smaller scale by coding a program that counts the frequency of letters within a string. And that task is presented as this month’s Exercise. I’m fascinated by grids. 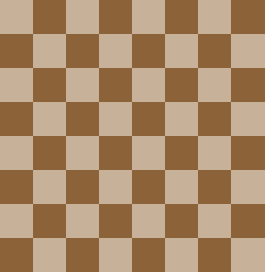 Consider the chessboard, which is a grid. Or think about the most basic game grid, a 3-by-3 array for a game of tic-tac-toe. Programming a grid is a common thing, so your best hope is that this month’s Exercise is yet another super cinchy silly grid program.